In 1996 as a novice sailor, I was upset to learn that the Dacron sails for the Bolger Cartopper I had just built would cost me almost as much as I had invested in the boat itself. Thinking that there must be alternative materials that would still allow me to sail my boat around a local lake, I purchased a cheap green polyethylene tarp (polytarp) at the hardware store and taped together my first sail. Now sixteen years later, I have constructed hundreds of sails and my sails have improved exponentially in looks and performance, but I still make all my sails from tarps - for what I believe to be good reasons. What follows is my case for polytarp sails. Andrew Linn and Mike Monies prepare to launch SCAMP in the 2011 Everglades Challenge, a 300-mile journey from Tampa Bay to Key Largo. A 100 sq. ft. polytarp lug sail powered SCAMP. According to Mike, "It worked great and held up very well in some very strong winds. We used it with both one and two reefs and it held it's shape very well. At one point we were hit by a thunder storm with high winds (25 mph with gust to 30 mph) and we had to let the sheet fly to keep the SCAMP on its feet. The sail flogged for about 15 minutes until the storm passed without any damage." First, polytarp sails, as sails go, are relatively cheap to construct. A traditional100 sq. ft. sail can be built for considerably less than $100 from a 12' x 16' tarp, a couple of rolls of double-faced carpet tape, 50' of reinforcing line, a pair of scissors, a tape measure, and some duct tape. However, the finished product can vary greatly depending upon the knowledge level of the sailmaker and the quality of materials selected. That brings me to point number two in my case for polytarp sails. A second point is that quality materials for making polytarp sails are now readily available. No less an authority than Emiliano Marino, whose Sailmaker's Apprentice is a bible for aspiring sailmakers, suggested that first-time sailmakers and dinghy sailors who wanted to get out on the water quickly could make their own “…perfectly acceptable sails from Tyvek, polyethylene tarps (polytarp) London Fog raincoat material, bag nylon, or tent canvas—not to mention old sails.” (1994, p. 151). In another table, he suggests that blue or orange polyethelene tarp could be appropriate for "quick and dirty" sails under 100 square feet (p. 262). Of course, the choice of materials available was severely limited when the Sailmaker’s Apprentice was first published in 1994, and early tarp sail builders like me were limited largely to whatever was available in the local hardware store. Consequently, many of the early tarp sails were made from the cheap blue tarps that dominated the market. Sails made from these low quality tarps stretched easily out of shape and quickly disintegrated in the sun. But thanks to the internet and demand, higher quality UV-protected 5.2 and 6.0 oz. white, colored, and even striped tarps are now readily available for today's polytarp sailmakers and much more is known about the selection of tapes and lines that work well in shaping and reinforcing polytarp sails. PolySail International, for example, offers a 12' x 16' kit of these well-tested essential materials for just $74.95. A third point in the case for polytarp sails is that little specialized knowledge or equipment is necessary to construct a functioning polytarp sail. Novices can construct their own sails in a few hours with minimal instruction by rounding or hollowing sail edges and occasionally including a dart or two. With their controlled stretch and resiliency, most lightweight polytarp sails are shaped by the wind itself. Polytarp sails can even be taped together and function for a few outings before they need to be stitched around the perimeters. A home sewing machine in the hands of an amateur is often all that is required to finish a sail that will last for several seasons. Contrast this low-tech process with one in which a North Sails worker is “flown” across the surface of a high-priced synthetic sail formed over computer-controlled hydraulic surfaces in order to apply enough heat to bond laminates together to achieve a curved three-dimensional shape. Even for expert sailmakers who work with two-dimensional panels, the level of expertise required to make a quality sail requires years of apprenticeship. Sailrite kits, with their excellent instructions, allow novices to sew together nicely shaped panel sails; but the process is still labor intensive and much longer than shaping a single-sheet polytarp sail for the same purpose. A fourth point in favor of polytarp sails is that the low cost of materials and ease of construction encourages experimentation. Much of the reason tarp sails have improved so dramatically in the past few years is that sailors are now free to try alternative sails on their home-built craft to see which performs better. Tarp sails tend to lend themselves to the construction of traditional sail types such as the leg o' mutton, balanced lug, gaff sail, lateen, and sprit; but at the same time, some builders are experimenting with more exotic sails, such as the biplane rig, Polynesian proa, junk rig, and batwing. As a builder tries a new sail and discusses the construction on his favorite online forums, others are encouraged to try their hands at sailmaking. Today, it is not unusual for a home builder to have a suite of sails available for each new boat in his fleet. When he does settle on a professionally-made sail, often the polytarp sail has been his model. 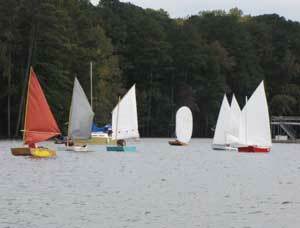 PDRacers flew a variety of home-built polytarp and other synthetic sails in the 2009 World Championship races held at Allatoona Lake, Georgia. All four of the previous points play an important part in the fifth point I hope to offer in the case for polytarp sails—that is that the availability of polytarp as a sailmaking material helps draw novices into the sport of sailing. Two centuries ago, nearly all boats and ships were propelled by sail; so workers and wealthy sailors alike were familiar with sail and nautical terms and concepts. As steam replaced sail in the late 19th Century, sailing lost much of its broad appeal, but survived primarily through club racing and a growing interest in home boatbuilding. Today, many yacht clubs and sailing clubs struggle to maintain their memberships because sailing seems to be so narrowly focused on expensive racing classes. 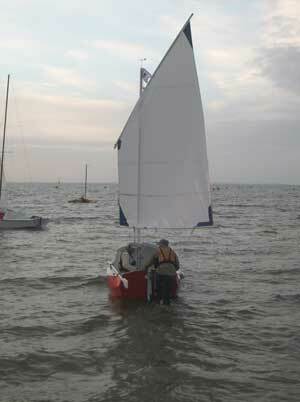 Even an Optimist dinghy can cost over $3000.00 for a race-ready 7' boat. Polytarp sails allow home boat builders to build, race, and cruise sailboats up to 20' within a modest budget, and to me, the learning associated with building sailboats and sails may be the lifeblood that revitalizes sailing. Web forums abound among home builders where people can learn nautical terms and concepts from the wide experiences they share rather than from the rather narrow and limited focus of club racing. One of the fastest growing "underground" sailboat classes is the Puddle Duck Racer (PDR), a 4'x 8' "racing" scow development class. Even with unlimited sail choices available to builders, most puddle duckers choose to construct their own boats and build their own polytarp sails—usually for less than a $350.00 investment in both boat and sail. And, the low-cost approach seems to be working. In a short seven-year span, there have been over 530 Puddle Duck hulls registered. Of course, that’s far short of the 300,000 or so Optimist dinghies that are out there, but then again, the Optimists had a 56-year head start and have now morphed into a highly restrictive sailing class. Polytarp sails may not yet have reached the levels of durability, refinement, and shape of the finely tuned synthetic sails of well-known sail houses, particularly in Bermuda-type sails, but they may be catching up fast in other more traditional sail types, such as the lateen, leg o’ mutton, sprit, and balanced lug. Polytarp sails have already been proven in three Texas 200’s, a 200-mile raid up the Texas coast sponsored by Duckworks magazine. 100 sq. ft. polytarp lugsails are being campaigned this year on two newly designed small SCAMP cruisers under the joint sponsorship of PolySail International, Duckworks, and Small Craft Advisor. The two SCAMPs will participate in a number of adventure sailing events where the durability and performance of their polytarp sails will be significantly tested. In addition, racing classes which allow experimental rigs, such as the Puddle Duck Racer, will no doubt begin to see head to head competition between professionally made synthetic sails and polytarp sails in their regional and world championships this year. This year’s PDRacer championship event at Lake Eufaula in Oklahoma, saw one of the PolySail International lug sails best all comers, including purchased board sails, and other professionally made sails. Next year might be a different story, however, as builders ramp up their investments in these boats and begin to take the "cheap" out of the class motto of "Cheap, creative, and …fun on the water." It will be interesting to see how long PolySails can continue to compete.